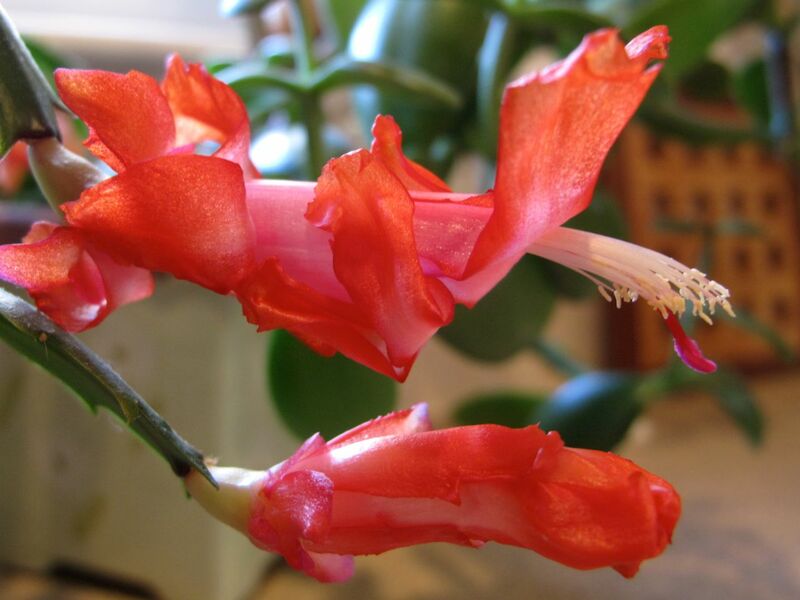 I confess I have only just learned Christmas cactus belong to the genus Schlumbergera, but this is a plant I have known all my life. Ubiquitous in the home of every relative and friend I knew as a child, a Christmas cactus was one of those plants easily shared and easily tended and thus passed-along and treasured as an heirloom. This one, full of timely blooms, is commanding attention. It was a gift several years ago from former neighbors, who across the miles continue to be special friends. Being able to associate my plants with people is one of the pleasures of gardening. 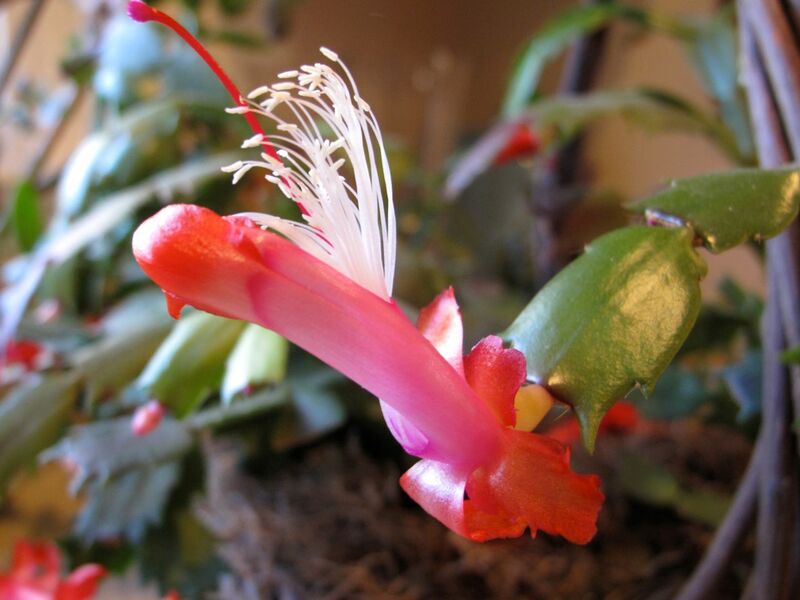 This entry was posted in garden and tagged Christmas cactus, pass-along plant, Schlumbergera on December 19, 2013 by pbmgarden. Beautiful photos of this intricate flower! I have seen some lovely examples, but have never owned one. I’m not terribly successful with houseplants, so probably just as well! Neither have I but this one is very hardy and takes a lot of abuse… just ask mine : – ) might be worth a try, they are a great treat. Thank you Cathy. I don’t like to fuss with houseplants either and can assure you this is one undemanding. Spring is on the way–as soon as we get through winter, Judy! hang in there. Beautiful photos! It is wonderful, isn’t it, to be able to look at your plants and think of friends who have shared them with you. Yes, plants make great memory-keepers! We are death on house plants, literally. They are too needy for us. But I do like Christmas Cactus. We used to have one and I miss it. I understand completely. The only house plants here are those that put up with being ignored most of the time. Lovely color! I agree that plants are a great reminder of friendship and the memory of incidents that brought them about. It’s fun being able to tell friends and neighbors how certain plants came to exist in our home. Many of them have their own, sometimes oddball history. I like that color too! Sounds like the oddball history of your plants would make a great post. I purchased a Christmas Cactus today that was starting to bloom and potted it in a pitcher that I bought at a vintage store. The flowers are not quite here yet, if it looks even partially as beautiful as your picture it will be a success. Oh that sounds lovely in your vintage pitcher, Charlie! Hope you’ll enjoy it. Poinsettias are lovely this time of year. Do you keep them throughout the year? With poinsettias I have little patience once the holidays are past. Pbmgarden, as nice as the poinsettia looks during the Christmas period, I get sick of the seasonal red colored ones really fast. (Right now I have two reds and a white at the bottom of a Norfolk Island Pine in my TV room, they were gifts). For some reason I can take a white or pink one longer, but no matter the color, even if it is still in good shape (probably around March) out it goes, enough is enough with that seasonal plant. Our plant has just 2 flowers this year and they look lonely on a big 9 year old plant! That’s an oddity to ponder. Wonder what happened? This is the first year mine has had so many flowers. Merry Christmas and Happy New Year pbmgarden. I too have a plant that brings on memories, it is a Norfolk Island Pine that was given to my sister, at the time of my Father’s death eighteen years ago. She kept it for a while, but knew I would take care of it better. On and off over the years it has served as a extra Christmas tree in one of the rooms, and i think of the lady named Valerie who gave it to her. Thanks. Your mom would probably be pleased as punch to share her Christmas cactus. Great shots…mine are all blooming…have been blooming for months actually…all are gifts. Merry Christmas! !